his first meeting with Lama. There was a monk in my class who most people know as Chomphel—he was Kopan’s cook for many years. 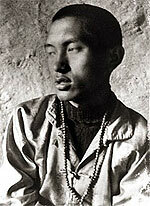 Along with Lama Pasang and other Tibetan monks, he was taking teachings from Lama Yeshe. At that stage I was only receiving teachings from Geshe Rabten and then only when he wasn’t busy, as he had many disciples and had to teach many different texts to different classes. present and future depends on the guru. I stopped again and again, saying, “No, I don’t want to go,” but he kept pushing me. It was quite far to where Lama Yeshe lived on the mountain, about half an hour or an hour’s walk, depending on how fast you walked. Even when we reached the hut I wanted to retreat. I had brought no offerings, which was partly the reason for wanting to go back. When you first make contact with the guru it is very important to perform the offerings correctly. How many teachings you receive depends on that. So much depends on that, as you know from the stories of Milarepa. For this reason I didn’t receive many teachings at Buxa. I had asked Geshe Rabten which teacher I should go to for teachings, but he didn’t say which one. He was a very skillful teacher, knowing exactly what was best for the disciple. I could feel what he had in mind and he said it didn’t matter what one learned. On my first day I sat on the same bed as Lama Yeshe because of having the name “incarnate,” something like that, and the others sat on the floor. The teaching was about cause and effect. I didn’t understand anything at all—I think because I went with a bad motivation. I thought, why couldn’t Lama Yeshe teach more slowly? Although the others could understand, I couldn’t. Then on the second day I could understand a little better. I think that’s because I had been guided by Lama Yeshe in many lifetimes, just as you have. So, even though I had no strong wish, there was a strong force, karma, between Lama Yeshe and myself. So you see, there was definitely contact in past lives. He hasn’t only helped and guided me in this life, but he planted seeds in my mind in many past lifetimes. I think you can see in this clearly why all the happiness of the past, present and future depends on the guru.